If I had to choose one word to describe January, it would be gluttony. This was the month of the best eating ever! We rang in the new year in Bangkok. It was actually our fourth time in the city, but our first time to properly explore it. For some reason (and I’m gonna sound like a really bad traveler now), we just weren’t that interested to see the main tourist attractions, like the wats or floating market. We didn’t even go to the Royal Palace (reason? we didn’t want to wear pants). We had just come back to Thailand after over two weeks in Siem Reap, and as much as I enjoyed Khmer food, I couldn’t wait for variety and spice again! And so, all we wanted to do in Bangkok was to eat as much as possible! 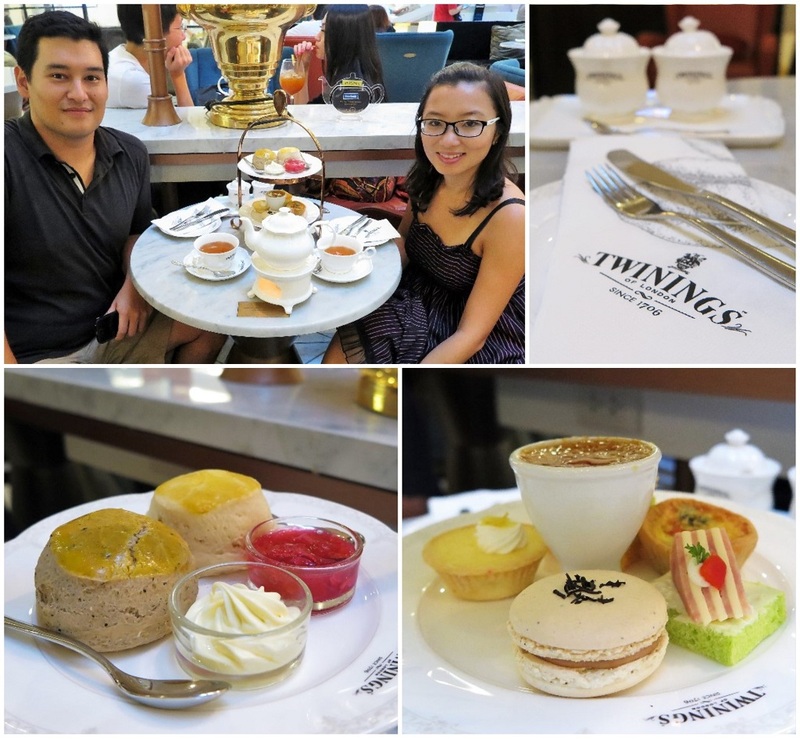 this set at Twinings was only US$18! the buttery scones with cream and rose jam was so heavenly! The rest of our week+ in the city was spent searching for good eats. I realized that I was actually a little tired of pad thai & basil chicken & curries, so we looked for more Chinese-influenced foods. 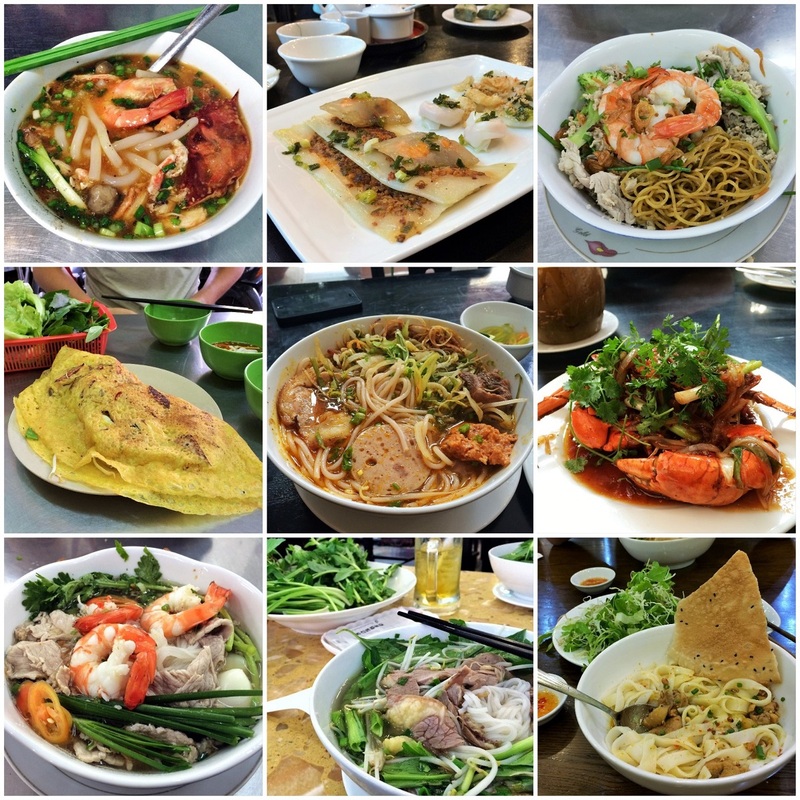 We ultimately found our favorite places for noshing: Chinatown and Bang Rak. As a foodie, Bang Rak is the place to eat at during the daytime, and Chinatown is the place to go come nightfall. I haven’t written anything yet about the stuff we ate there (as I still seem to be stuck on Cambodia on the blog) and I’d love to talk all about it now. But as I’m going through my Chinatown pictures for this post, I know that it’s impossible to capture the true spirit of this area in just a short round-up. I will need to expand it into its own post! Here is a sneak peak at some of the best food we had! grilled giant prawns in Chinatown! we demolished two of these plates! The first three times, Bangkok functioned as more or less a pass-through city on the way to our next destinations. Every time, I couldn’t wait to leave to get to where we really want to go. But this time, I felt a little sad to say good-bye. And this time was also us saying good-bye to Thailand for the foreseeable future. 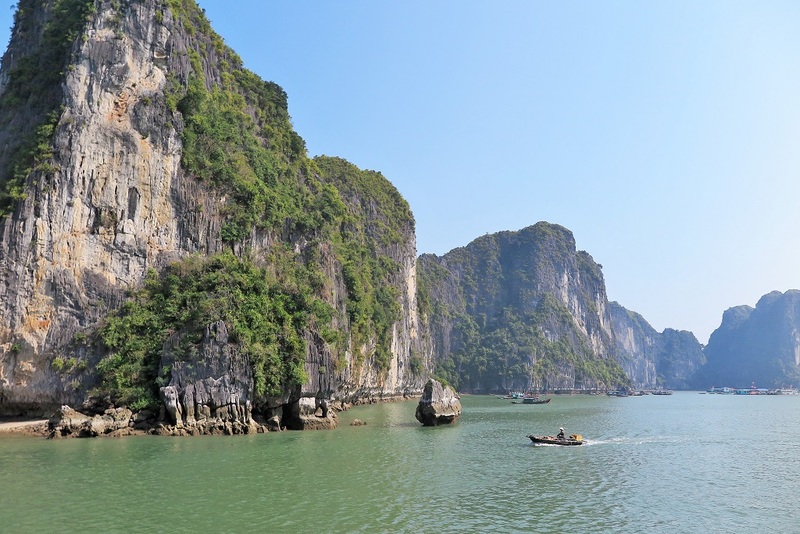 But we were headed next to Vietnam, the country I’ve been most excited to visit! Let me end our adventures in Thailand with this: my favorite picture taken in Bangkok (at the Chatuchat market)! random? 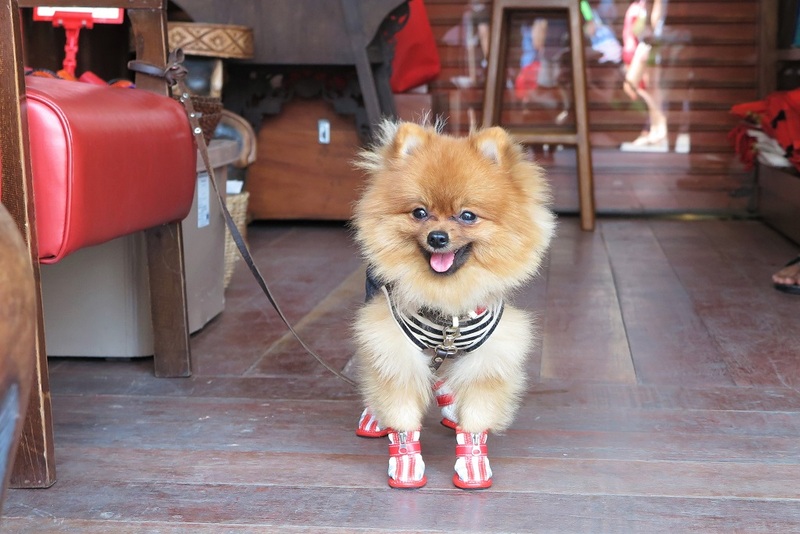 yes, but it’s a POM WEARING CLOTHES AND BOOTIES!! After 2.5 months, our time in Thailand may have come to a close, but I still got a couple of posts in the works, so keep an eye out! 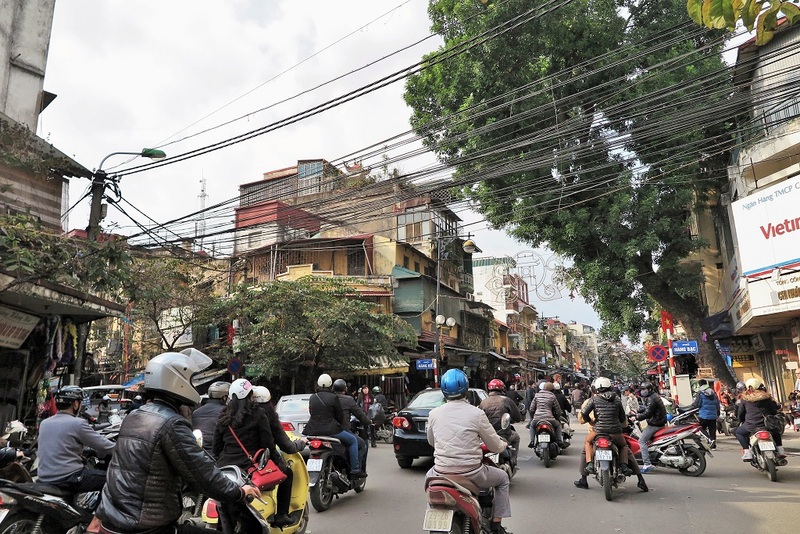 Despite having been to China and other Southeast Asian countries, Hanoi was NOTHING like I’ve ever experienced before. If I thought Istanbul was an assault on the senses, then it’s got nothing on Vietnam. If I thought traffic was wild in Siem Reap, then it’s practically tame compared to the madness on the streets here. This city is a madhouse. You have to be on super high alert at all time. But it’s all SO exciting! Honestly, there is not much to see in Hanoi. But it was so exciting to just walk around town and simply observe all the life and activity. 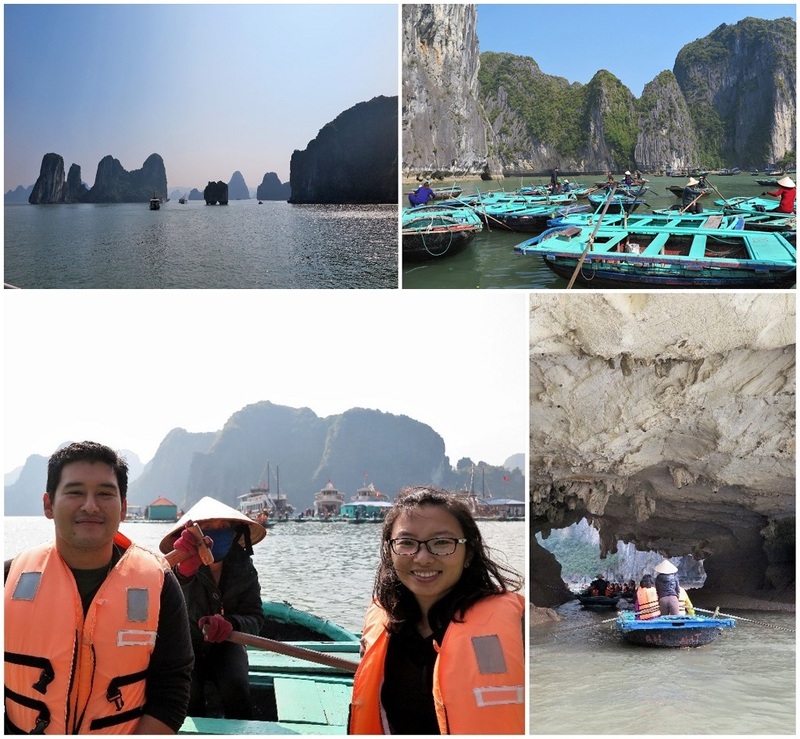 Somewhere in the middle of our two weeks here, we fit in a mini trip to Halong Bay. It was a gorgeous day (if a little foggy, but that only added to the atmosphere!). When planning this Halong Bay trip with our hotel tourism agent, we had originally planned for a two night stay at Paradise Suites Hotel. But literally just days before this trip, the agent told us that he just returned from a trip there himself and that the hotel is very boring, so he recommended that we change it to one night only. We took his advice and stayed only one night. Oh how I wish we hadn’t listened! This was the most luxurious hotel room I have ever stayed in! The bed was the biggest bed I’ve ever seen (it was wider than it was long!). The down pillows were the softest I’ve ever laid my head on. It was literally like resting upon a puffs of cloud. So heavenly! I haven’t had such a good night’s sleep in ages. it was only $80 a night. I would have paid that much to stay here one more night! We fully enjoyed our one night there, including splurging on wine and a fancy dinner at the hotel restaurant (by splurge, I mean that the total bill was US$35 :P). This definitely proved the fact that even though we are very budget conscious, I love some luxury every now and then! Maybe we’ll even make occasionally checking into a nice hotel a habit. :) We returned from Halong Bay very well rested. Once back, it was our mission to discover all there is to discover about North Vietnamese cuisine. Vietnamese food is already one of my favorite cuisines, but SoCal only has South Vietnamese restaurants. So northern style food is completely new territory to me. Don’t worry, I will do a full post talking about all about the food! Which one looks the yummiest to you?? Our first week was spent in District 1 (though not in the center). It was a bit of a disappointment at first after Hanoi. I loved the closed, cramped quarters of the old city in Hanoi. There was so much life going on every square feet. By comparison, HCMC seemed more sprawled out, less intimate. I love Vietnamese food more than ever now! This month was probably the hardest for me emotionally. All the despair I’ve had over the past few months over struggling with writing and feeling loss of purpose came to a head this month, and I ended up writing more personal pieces on the blog because of it. I just want to take a minute to thank everyone who took the time to comment, email me, and/or share your stories. Because of all your support and suggestions, I’m feeling much better already! I’ve been finding things to keep me busy (you may have noticed that I’ve been doing minor blog makeovers and my spanking new About page!) and I’m looking forward to the next few months! On Friday (the 6th), we are headed to Singapore! Honestly, I’ve never felt an urge to visit Singapore, but we wanted to go somewhere really fun for Chinese New Year. Singapore always does a huge celebration, and as a plus, they are also celebrating their 50th anniversary this year, so I imagine that it will be EPIC! 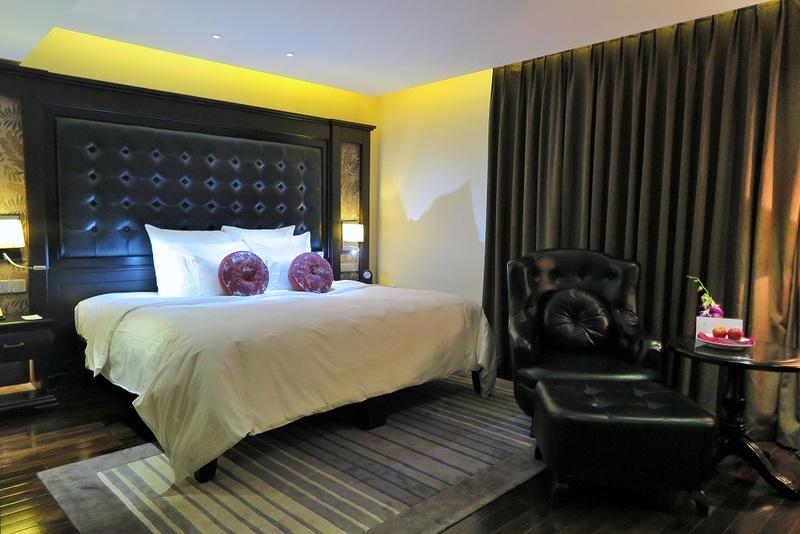 Our time in Singapore should be interesting because we will be staying with an expat family in their extra bedroom (Singapore is expensive and we can’t afford our own rental this time!). The best part is that we are staying there for an entire month. Once again, I’m so looking forward to fully unpacking and settling down somewhere for a whole month! Have you been to Singapore? What are you best suggestions? As always, I’m most looking forward to EATING! This post is linked up to Travel Tuesday with Adventurings and Sunday Traveler with Pack Me To. I love the look of the Vietnamese crepe! How exciting that you’ll be there for the 50th! I’m sure it will be something to always remember! Yeah I’m actually really excited to visit Singapore now! I’ve never really celebrated Chinese NY before, so super excited to celebrate it in such an epic way this year! The crepe was pretty good. The wrapper is a rice batter with coconut milk and turmeric powder! 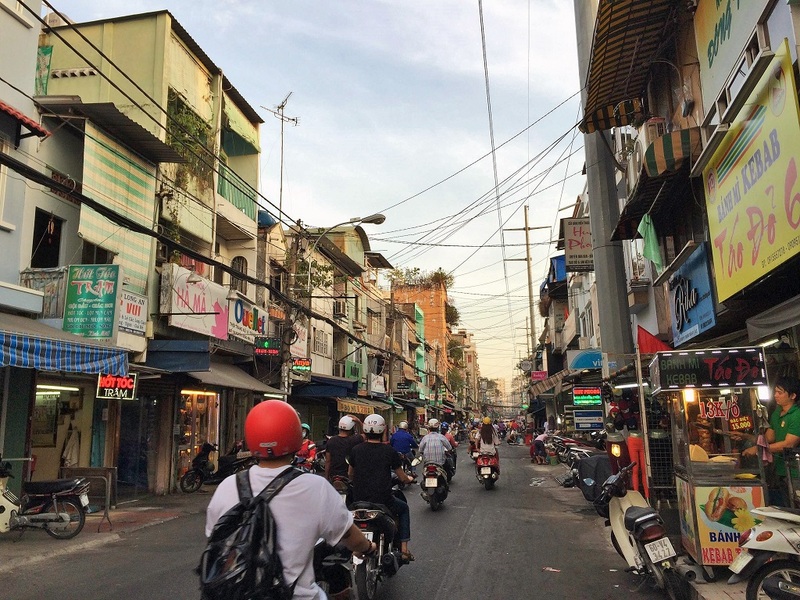 We spent about a week and half in Hanoi last May. Even by the end I was still scared to cross the street. Sergey would actually get mad at me. And when we drove on the motorcycle in that city I would get so anxious that I would close my eyes. No lie! Good thing one of us in this couple can navigate traffic like a local. We didn’t get to do the motorcycle taxi thing… no way… that looks way too scary!! But I’m proud to say that after this time in Vietnam, we’re crossing the street like pros now. :D The way to do it just slowly walk out into the street and you’ll just part the scooters like the red sea, lol. Omg they were soooo good, and I’m normally not a huge seafood person too! We ordered only one plate at first, but were so good that we got another! Oh man Anna, I cannot express my jealous enough that you are going to Singapore for a MONTH. Before I ever went to Europe, Singapore stole my heart in a big way. I hope you love it… I think you will continue to eat well. It’s more expensive but you will find plenty of great food courts. And yeah, of course I’m dying looking at alllll of your delicious food pictures. Ohhh Vietnamese food! Finally a lil’ hole in the wall semi-Vietnamese place opened in CB (it’s about time, seeing as the Vietnamese population here is pretty sizeable!) It’s still really Westernized but something’s better than nothing! I’m so glad to hear how much you love it! We’re a little worried at how expensive it’ll be and going over budget, but the good thing is that we were wayyy under budget for Vietnam. And I think the hawker food stalls should be pretty reasonably priced. The reason we’re staying for a month is 1) not to miss Chinese NY celebrations, and 2) we’re lazy and need to stay put for a while! I LOVED the month of eating Vietnamese food! I hope you’re enjoying Vietnamese food in CR. I’m surprised it’s not more authentic because there is a good population there! I had some pretty good pho in the CR! I’m so jealous of all the food! And that DOG! Eee! I was surprised at all little I actually knew about Vietnamese food (despite claiming it as one of my favorite cuisines!). All we get in SoCal is pho and vermicelli bowls and spring rolls. I can’t wait to talk about all the food I discovered! Wow!! Your January is like a food paradise. I’m a Vietnamese and I’m glad you enjoy the food. Yes the food in Vietnam is SO good! Personally, I think the best out of all the countries I’ve been to! So pumped about the coming food posts! These are fabulous pics! 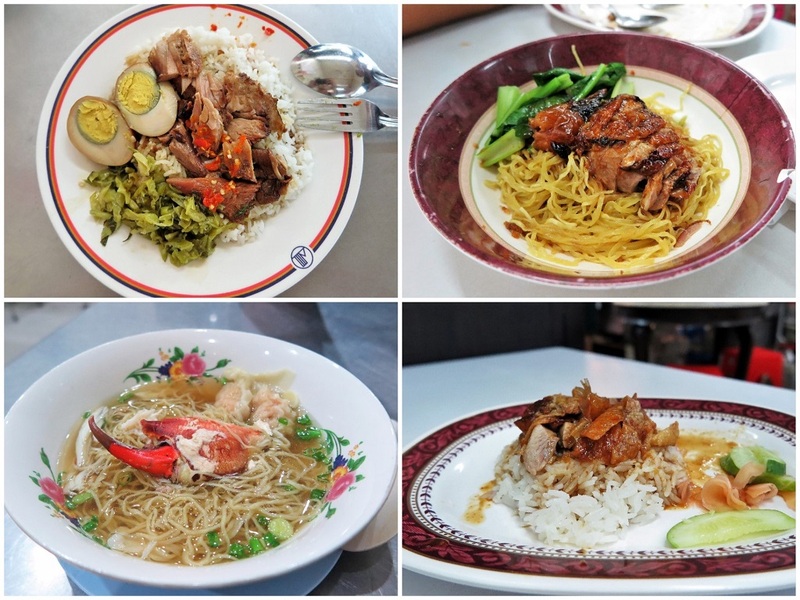 In Bangkok, we actually did a food tour of Bangrak and it was amazing (and so, so filling). We actually followed it with the brilliant idea of seeing the Grand Palace and Wat Pho afterwards (complete with putting on long sleeve and skirts/pants) and I’ve never been so happy to just sit and have a beer afterwards. Hooray for all the food! How did you guys travel from Hanoi to HCMC? Oooh doing a food tour of Bangrak sounds like an excellent idea! I’m so glad we discovered that area and all its food! Did you go to Pratchak (sp?) on your food tour for their duck noodles? It was just out of this world! Haha, we did NOT want to wear pants, so we skipped the Grand Palace. We flew from Hanoi to HCMC. I think we didn’t plan Vietnam too well, or else we would have planned for more stops along the middle. :( Oh well, there’s always a next time! I hope you enjoy Singapore! I really loved it but I could imagine it is very different than the rest of SE Asia. I loved Palawan beach on Sentosa Island (again, I’m sure it’s nowhere near as nice as the beaches in Thailand) and I loved eating at the Hawker Markets – the food in Singapore is awesome and there is food from all over Asia. I recommend heading out to the Bukit Brown Cemetery which is completely overgrown and beautiful, the Orchid garden at the Botanical Gardens, Gardens by the Bay to see the light show in the Supertree grove in the evening, go to the bar at Marina Bay Sands, you get the view without paying the observation platform fee, Chilli crab at Jumbo, Buddha tooth relic museum in Chinatown. Have fun! We’re enjoying Singapore a lot so far!! I’m glad there’s cheap (and delicious!) food at the hawker marts. :D The beach on Sentosa sounds so interesting! We will definitely make a trip out there. Thanks SO much for the tip about the Skybar at Marina Bay Sands!! We just did that today! And we didn’t even have to pay for an overpriced cocktail to go up there to see the view!! 1. Before you ask a local for food advice, ask whether he is Malaysian. If he is, listen and then disregard his advice. Malaysians are generally negatively biased towards Singaporean cuisine so they (actually we) might not give you good advice. 2. Or you can always hop on a taxi (S$50) and head across the causeway to JB in Malaysia for Malaysian food. Singaporean Chinese food will be less flavorful compared to Thai/Vietnamese food. Malaysian food is somewhere in between. 3. You can check this blog out for inspiration I guess: http://www.misstamchiak.com/ .. I don’t know the author, but I think this is one of the most famous Singaporean foodie blog. 4. My personal favorite restaurant in Singapore? It’s called the Soup Restaurant. They are a restaurant chain and have a website (http://www.souprestaurant.com.sg/) so it won’t be as cheap as food courts. You can expect to spend S$20 to 30 per person per meal here. I love their steamed fish and double boiled soup. 5. You probably need to make plans for dinner on Chinese New Year Eve (18th Feb). It’s reunion dinner time, so restaurants would either be closed of fully booked. Going across the causeway to Malaysia sounds like a good idea to us! I’ll have to research what to do in JB in Malaysia. Yeah, it seems like that everyone is saying that usually all restaurants and shops are closed on CNY. I think we’ll probably just cook that day, or order food beforehand and stock up! Oh my goodness. I knew better than to look at this post before eating lunch, but I did it anyway. And now not only am I super hungry, but also super bummed I can’t eat all of this right now! I would love to learn more about Vietnamese food! I know nothing about the regional differences and would love to learn! And have a great time in Singapore! I’ve never been, but my friend Edna at http://www.expatedna.com lived there and has great taste in food – looks like she’s written some posts on Singapore if you’re interested. All I know is that black pepper crab is highly recommended to try! Thanks!! I’ll check out her posts! Oh man, Vietnamese food was soooo good. Before going, I’ve really only had pho and vermicelli bowls. I was so happy to discover all these other dishes. And the best part is that the food is all so fresh with a ton of herbs! I can’t wait to talk about it soon! My god, all that food looks AMAZING. I can’t wait to hear more about it! Also – how are you finding Disqus as a comment platform for your blog? Have been thinking of switching over myself! Haha I’m kinda excited to go back to Changi airport on our departure date, so I can see what all the fuss is about! I really want to go to Australia! But it’s sooo expensive, no? :( And I don’t think we’ll be close anymore… we have China planned in April-June to meet my family there. But nothing is planned yet for after that! I’m really loving Disqus so far! I think it let some new people find my blog already because of the email Disqus sends out. And I like how it looks a lot more than the WordPress one! I really recommend it! Oooh, awesome. I think I’m definitely going to switch over. Did you have any trouble with it in terms of integrating comments already made on past posts? I just started the export process right before I went to sleep and when I woke up in the morning, it was all done! Good luck! And thank you – literally switching over to Disqus as I type. The tutorial was very straight-forward and helpful! It’s pretty good so far! Though I do admit I miss the Vietnamese soups and the fresh herbs a little! Sounds like a fabuloussss month! And all those food pics – sigh. Lovely, lovely clicks! It was amazing! Vietnam has some of the best food in my opinion. Missing it a lot now! What a month that was!! Those prawns look amazing as does the roast duck with rice! 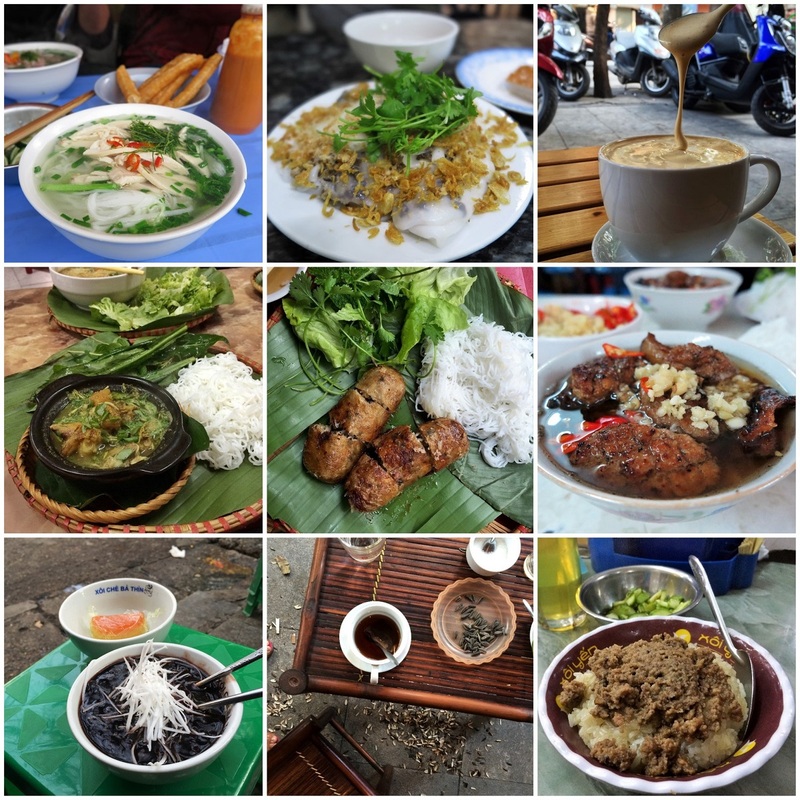 Did you prefer the food in Vietnam to that which you tried in Bangkok – I can’t call it myself as I enjoyed them both so much! Singapore (as I’m sure you’re seeing for yourself) is an absolute foodie heaven – the hawker streets are full of amazing foods. 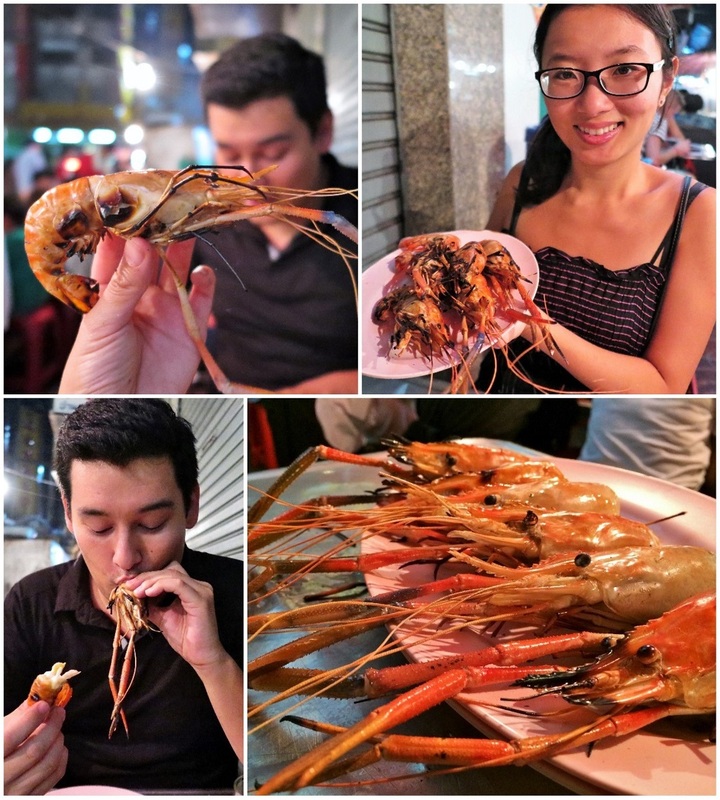 If you love prawns, don’t miss cereal prawns oh and definitely head to Jumbo seafood! It’s amazing and we went with some family who stay there so we knew we were in safe hands with recommendations! PS, that afternoon tea is such great value compared to the prices at home here and it did make me chuckle that you polished off all the pastries and cakes yourself – guessing D’s sweet tooth isn’t quite so potent?! You know, I think I actually do prefer Vietnamese food (though I discovered some of my favorite dishes ever in Bangkok)! I think overall, street food in Vietnam is a lot better quality than street food in Thailand, for comparable prices. And I love all the fresh herbs you get with everything! I remember feeling like I’m lacking in veggies in Thailand. Oooh yeah we haven’t gotten the chance to try the crab in Singapore yet (I’ve been eating all the Indian food I can find, hehe). You’re not the first person to recommend Jumbo’s so I think a visit there is definitely in order! D’s definitely not as much into sweets as me (and he complains about a gluten intolerance though I’ve known him to wolf down bread and dumplings). That’s why I can’t wait to go to London again and get afternoon tea with you!